Our guide in Guilin, Frank, was great. It was nice to be met at the airport and transported to the hotel. Frank’s attitude was very helpful and his English was good. Frank volunteered information and answered our questions. He was also very knowledgeable. Frank was very helpful the last night when our flight was canceled. Between him and your office you managed to get us on a flight which was important to us, even though we got to Shanghai rather late. We didn’t have much interaction with the driver. He did a fine job of getting us where we needed to go and showed up where Frank told him to meet us. One meal was arranged for us the last day of our stay in Guilin. It was a western meal at the Left Bank restaurant. The meal was sort of mediocre. It probably would have been better for us to eat a Chinese lunch with our guide. The service and environment of the restaurant were fine. Guilin Bravo: Fine hotel. Western breakfast could have been better. For example, the orange juice was watery and the pancakes were watery. However, the eggs and bacon were good. Very pretty next to the lake. Renaissance Shanghai Yu Garden: Breakfast was good. Great location. The main thing I appreciate about TCG is ease of making these arrangements. Abbey and Carol always responded to our pretrip questions or concerns promptly and efficiently. This trip was added on to a physics conference a colleague and I attended in Shanghai and all went smoothly. All of the meals were very good, I don't think we can single out one as exceptionally better than the rest. The lunch in the home in Xian was very well appreciated by all the guests, it was a treat, very different, the food was very good, and the atmosphere was great, that was fun. The lunch the day before, the Cantonese restaurant was also enjoyed by everyone, this is the closest to what we see in North America for Chinese food, very good! The lunch on the cruise, as you warned everyone, was not the best, it was OK, everyone did as you said, had a big breakfast, so in our group very little lunch was eaten on the cruise. The lunch on the last day, I cannot remember the name of the restaurant, the Western style lunch, was also very good, that was enjoyed by everyone again. Both guides were good, language was excellent, knowledge of the area was good, our second guide did not share as much information as the first, about the local area, etc. Our first guide in Xian offered a lot more information and answered questions. Also our second guide should learn a little more about what might be offensive to some people, he did not badly offend any of our people, but some of his jokes used some language that some people would not like. Because no evening dinners were planned in the itinerary, I think it would have been nice if the guide offered some suggestions near the hotel for dinners, I am sure if we asked they would have helped but we ended up having dinners at the hotels and it would have been nice to see more outside the hotels. Both drivers were excellent, friendly, knowledgeable about the area, and both busses were clean and comfortable. Excellent hotels, no problem, clean, comfortable, good service. The only small problem we had was the transportation issue to visit the farmhouse, we understood we would have the choice of riding bicycles or taking golf carts, and we understand that the rules have changed. It was a bit confusing, I think the new rules mean that the golf carts cannot go there anymore, but we never did understand why the bicycle option also was gone, then we walked a few hundred meters to get on the bus instead, this little walk was not needed, some of our group was a little older, and did not need that extra walk. Overall, everything was excellent, we were all happy with the service again this time, the sights were all well chosen, and well shown by the guides. The transportation was excellent; we will be looking to arrange more trips with TCG in the future! We were impressed with all the restaurants which you had chosen for us. They were obviously chosen carefully because each one was very nicely decorated, clean and neat. The service was also good. The food was good and we were pleased with the generous allowance per person that you had allocated as we could choose the dishes that we wanted to eat and still come out within budget. Our guides helped us choose dishes which reflected the local cuisine of each city except for one meal in Beijing that had a set menu which we also enjoyed. The one restaurant that we would remember most was the one in Beijing where we had lunch on our first day. We sat outside in an enclosed garden area because there was a wedding inside but we really enjoyed the outside setting. We also had Peking duck there. We had chosen female guides and we were happy with all of them. They were patient and helpful with airport transfers, check-ins at hotels and airports, etc. We arrived very late in Xian after our flight was delayed in Beijing for several hours, and our guide was waiting there patiently for us and checked us into the hotel. Our guides were knowledgeable, had good English language skills and were always cheerful and patient, as I mentioned above. Even the guides that we met briefly in Chongqing (to take us to the boat) and in Yichang (to meet us after the boat) were very helpful and gave us details of each city in the bus. We certainly learned a lot about both cities. 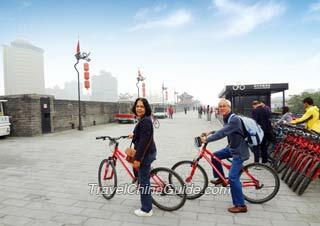 Our guides in Beijing and Xian were particularly good with additional information and answering questions, as they had to cover the historical sites. Their knowledge of the history of the country was excellent and they could answer most if not all of our questions. Our guide in Shanghai was competent, but I think she could have provided us with more information about what to do on our free day. In the bus she chatted with the driver rather than with us, and responded to our specific questions rather than talked about the areas we were driving through. We would particularly like to commend our guides in Beijing and Xian for their excellent knowledge and competence. They are obviously experienced guides and could anticipate our needs and questions. The vehicles were clean. Some were newer than others. The drivers were pleasant and certainly knew how to drive in the heavy and sometimes chaotic traffic. We liked all our hotels. They were as we would expect 5-star hotels to be. They were centrally situated and we could walk around in the evenings. 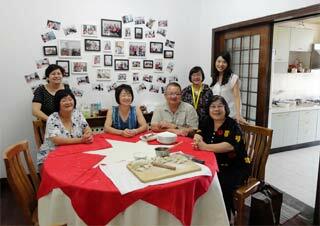 The breakfasts were very good and served both English and Chinese cuisine. We were particularly pleased with the service from Linda on the Sunday when the boat could not sail to Yichang because of a land slide and we had to be taken to Yichang by bus. We were concerned that we would not be picked up in Yichang at the right place. We phoned the office and Linda responded with phone calls and SMS, and so did the guide in Yichang. We were very impressed with your service on that day. Thank you for this photograph. It brings back happy memories. We were very pleased with the excellent service we received from your company with the reservations and throughout our trip. We had a great experience on our journey to Beijing thanks to TCG. Everything went exactly as described. The meals were extremely good starting with an amazing breakfast. More choices for breakfast than we could possibly try. The lunches were all very good and very tasty. Our guide, Doreena was very helpful in making suggestions on what to have. Everything she suggested was fantastic. The restaurants were all very nice inside and the service was excellent. We had a crunchy beef dish that was amazing, but everything we had was very good. Our guide was Doreena and she was simply outstanding. She made our trip so enjoyable starting with greeting us upon our arrival. We were concerned because our plane arrived late and it was 2:00 am local Beijing time. But there she was waiting for us along with the driver. On the way back to the airport we had to modify our travel plans which required us to leave the hotel at 4:00 am. Again she was right on time with the driver waiting. Each day that we were on a tour it was the same. She told us a time and she and the driver were right there. Everything worked just like clockwork. Doreena was an excellent guide. Her English was very good and she knew everything about the places we visited. She even knew where to stand to get the best pictures. Better yet, she would offer to take pictures of all of us and again because she knew right where to stand they all turned out fantastic. But most importantly, was her excellent descriptions of all the sites we visited. Another thing we liked about Doreena was that she was so helpful outside her duties as our guide. One evening we had scheduled a dinner and had no idea of how to get there. Doreena called the restaurant for us, confirmed our reservation and wrote down instructions to a taxi driver on how to get us to the restaurant. She also gave us her cell number in case we ran into problems getting back to our hotel. In fact she made it quite clear to call her anytime we needed her help while we were there. Knowing we could reach someone if we had problems really made our stay much more comfortable. Our journey also included a driver and van. The driver was great. He knew his way around the city and was always there waiting for us after we were done with an event. The van was kept in very good condition and was extremely clean. Any trash that was left behind such as empty water bottles were gone when we returned. We stayed at the Crowne Plaza Hotel. As I mentioned previously, the breakfast that was included each morning was simply amazing. Anything you could possibly think of was provided. There was even someone to cook you an omelet with your choice of ingredients if you so desired. The staffs at the hotel were very helpful. About the only thing that we found not up to four star standards were the rooms. They were on the well used side of things. Also, even tough it was in the winter, the rooms were very hot and you couldn't adjust the temperature. All in all, our trip exceeded our expectations. TCG not only delivered on its promises, but did so with style. The tours and food made our visit to Beijing a truly memorable experience. "Ni hao" from Aruba. First of all, thank you so very much for making our vacation a most memorable one. Thank you for your prompt email responses from our first contact to our final communication, patience, advice and for assisting us to build the best itinerary possible. It was a very tight schedule, but worth it. The step by step itinerary was our second guide, it really helped us. In one word the tour was perfectly organized and everything went as planned. Wonderful! No complaints at all! The food was good, but not really our priority. A la carte gives you choices but still it remain difficult. Looking at the pictures doesn't tell you much about the taste. So the guides always had to help us. Everybody is different when it comes to eating so I guess a la carte is still the best option. The restaurants all looked very fancy and the services were good. Definitely I would like to recommend the special roasted Peking Duck, more because of the way you have to prepare it and the way (wrap) you have to eat it. They give a little show to it which makes it much more special. The taste was very good! Because of the different cities we went, we had 6 guides during the whole visit and all were very polite and friendly. All guides were always punctual to pick us up at the hotels. They are all well-educated and very attentive. English was not a problem. Sometimes it felt like we knew each other for a long time. Knowledge of history of the visited sites was more than expected. English was more than sufficient to understand each other well. Nonetheless guides should always improve on their knowledge and language. We have nothing to complain about the guides, but praise for their services. We are very satisfied with their services and efforts to please us. 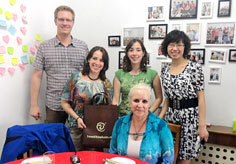 Our special compliments for Linda in Beijing and Monica in Guilin. They are so special to us. Drivers are not the least, they are very important concerning our safety in the difficult traffic. They have to drive safely and responsibly at all time in a very busy traffic. That's not so easy. But all drivers did a job well done. All cars were in good condition and very clean at all time. Water bottles were always available to us. It feels so good to be safe and sound back home. The hotels were well chosen as 4 stars hotels and locations were good. The service in all hotels was excellent and the rooms were all clean. All breakfast were excellent. Thank you so much for organizing such a wonderful trip for us. 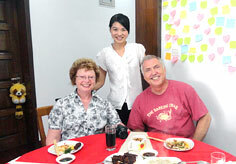 Happy clients is the essence of the tour and TravelChinaGuide made us happy. We truly enjoyed your services and will recommend this to our friends and perhaps we will return to your country in the near future.